On Sunday, I introduced you to Montauk Tackle Company, a firm on the east coast producing great shirts and pullovers for men and women. Today, I want to introduce you to a firm on my coast making great sweatshirts in San Francisco. American Giant is currently selling nice sweatshirts made in this country and soon plans to bring to market U.S. made T-shirts, button down shirts and jackets. In order to make great clothes in this country while still keeping the clothes affordable, American Giant has adopted a website only approach which means you don’t get to try the sweatshirts on before you buy them. That should not be a problem because American Giant offers free shipping both ways. If you have an issue with the product, you just send it back and they’ll refund the total price. 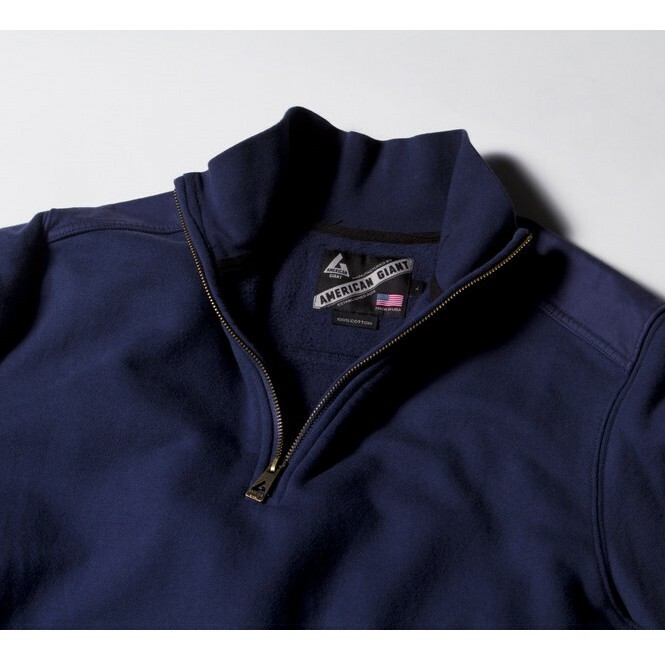 The American Giant product I have my eye on is the half zip sweatshirt in navy. The half zip sweatshirt is made from a heavyweight 100% cotton fleece with 5% spandex ribbing in the cuffs, waistband, and collar. American Giant reinforces the elbows, shoulders, and zipper garage with twill. The zipper pull is finished in Antique Brass. In order to prevent the horrible first wash dry pullover transformation, American Giant sweatshirts are pre-washed and shrunk to fit. And of course, all American Giant sweatshirts are Made in America. I know you are torn. What color American Giant sweatshirt should I get? I never said that those types of decisions would be easy. But there is an easy decision. That decision is to buy apparel like American Giant sweatshirts because they are made by members of our extended American family. They style and color of American Giant sweatshirt you buy is up to you! This entry was posted in american made, Apparel, Made in America, made in usa and tagged American Giant, Clothing, Montauk Tackle Company, San Francisco, Sweater. Bookmark the permalink.